Last weekend we decided to celebrate our 8th anniversary with a camping trip. We went out to one of our favorite places, the Los Padres National Forest. The weather was beautiful. Not too hot or cold, clear nights where you could see the stars, light breeze. Perfect! Well, aside from all the dang bugs.... lots and lots of deer flies and a few bees too. Steak fajitas, bacon/egg/veggie/hashbrown breakfast burritos, chips & onion dip, chicken burgers, pancakes, eggs, more bacon, and s'mores (of course!). 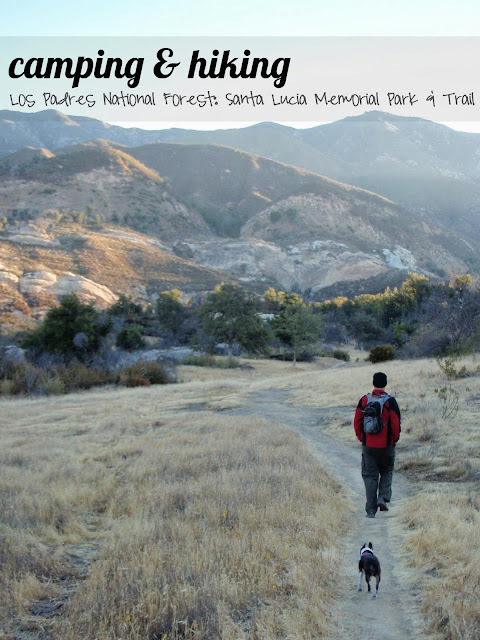 We planned on doing a hike on Saturday morning right after breakfast and decided on the Santa Lucia trail. 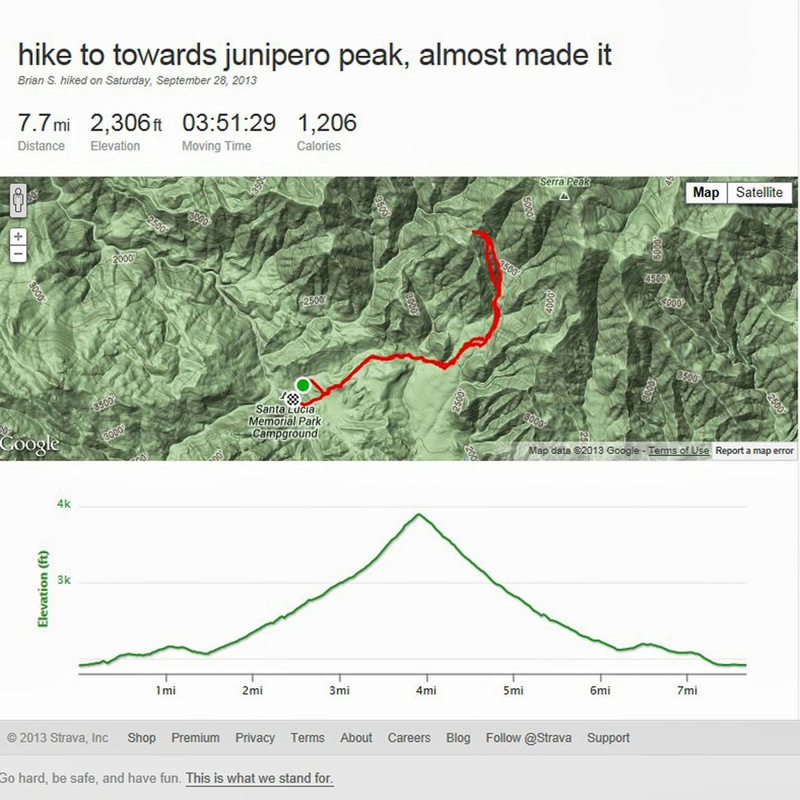 It takes you up to the top of the ridge line and, if we had gone a couple hours farther, to the top of Junipero Sera Peak. You can't even see the bottom where we hiked up from here! Wayyyyy down in the valley below in the center of the photo. We made it to the top of the ridge and I was done. It was pretty awesome standing up there on the top of that ridgeline though.... quite the view. Brian thought it would only take us half the time to hike back the 4 miles we hiked to get there and he ended up being pretty accurate! For the record, look at the trees on the right side. See the top of the ridge just to the left of those two big trees? Yeah, that's where we were on top of the mountain! The rest of the time out there was spent playing Phase 10 or Uno, Brian (or us + Scarlet) hiking down to the river to cool off, taking a nap, chasing the shade with the ice chests & chairs or eating. All-in-all, a good time. We got home mid-morning on Sunday and basically spent the rest of our weekend enjoying catching up on the first episodes of our favorite shows and some pilots for some new shows. And for the record, I definitely enjoy the camping/hiking option to the backpacking one. It is a lot better to be able to eat and sleep comfortably! 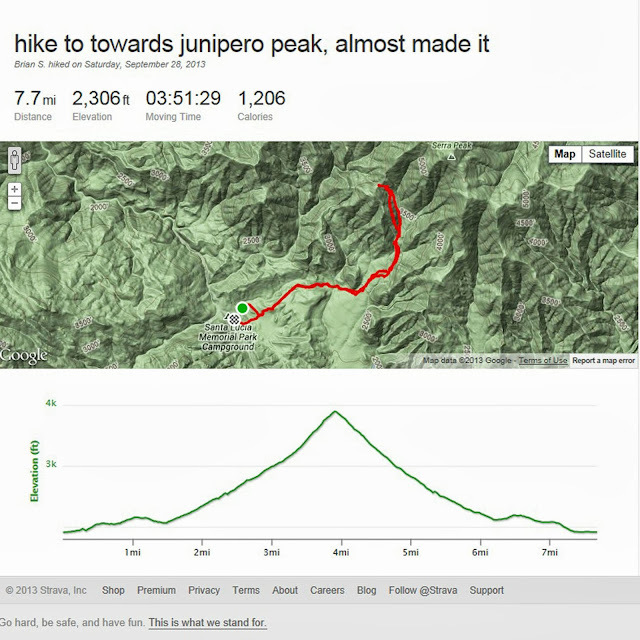 Looking for a trail map? This is a good one, this map is interactive to trail conditions and you can buy a great map from the US Forest Service (this is what we use!). 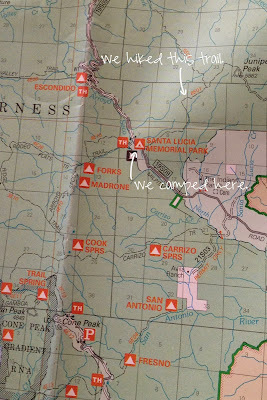 Looking for great information about this fantastic hiking/backpacking/camping area? Try the Ventana Wilderness Alliance (VWA). Do you like to go camping, hiking or backpacking?